read all the way to the bottom of this post to see how to win! Let's hang out with our Design Team & Guest to see what they made! Check out all the amazing projects below from our Design Team and September guest designer, Kimberly Rendino! Then, make sure to click through to all their blogs for details on their cards - Some of the designers have extra cards on the blogs and you might even find a fun video or two along the way! Make sure to comment for a chance to win! Details on the giveaway are at the bottom of today's post. 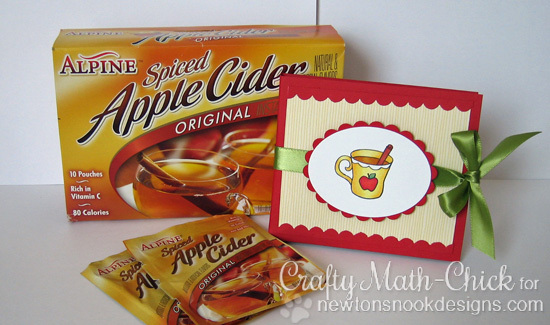 Crafty Math-Chick created a super cute cider holder using our cider mug stamp - what a perfect little gift! 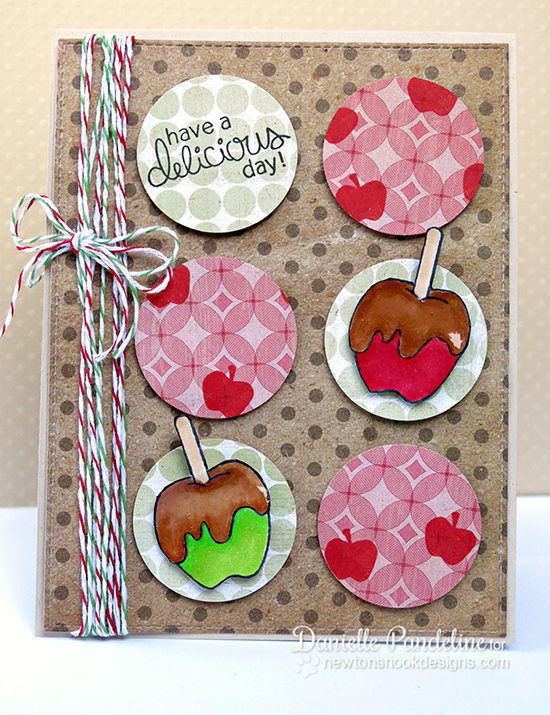 Mmm - Check out this yummy card by Danielle with some glossy apples and a fun circle layout! 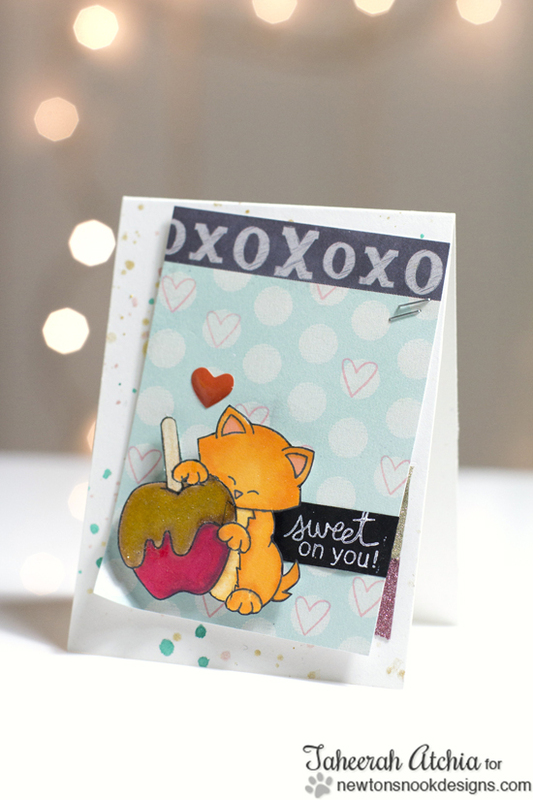 Check out the glossy caramel on those apples on this card by our guest designer, Kimberly Rendino - they look good enough to eat! 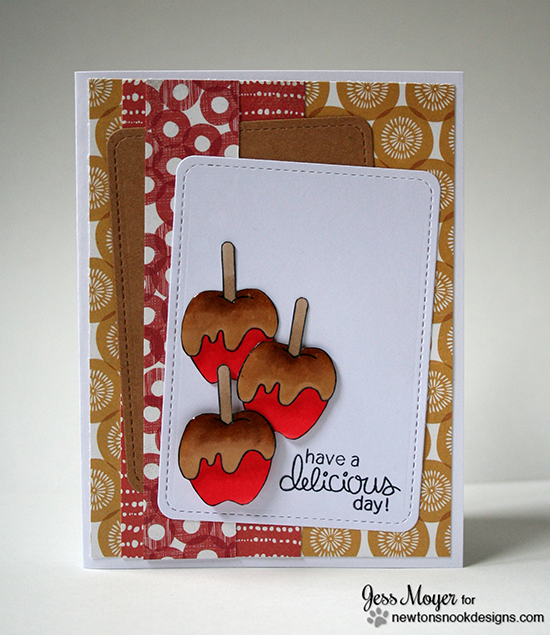 There is such a yummy trio of carmel apples on this card by Jess! 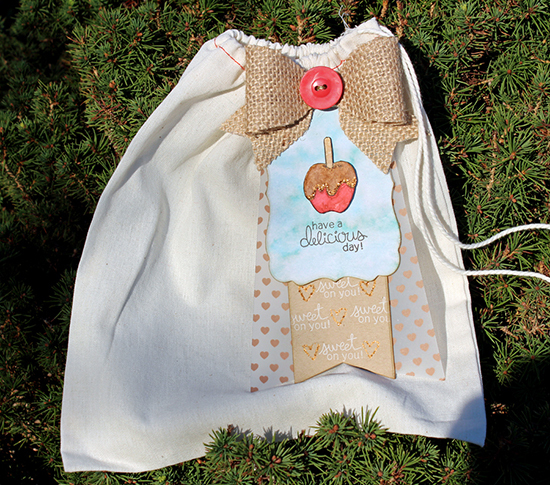 Larissa created this adorable treat bag tag! Wouldn't this be a super cute fall gift? 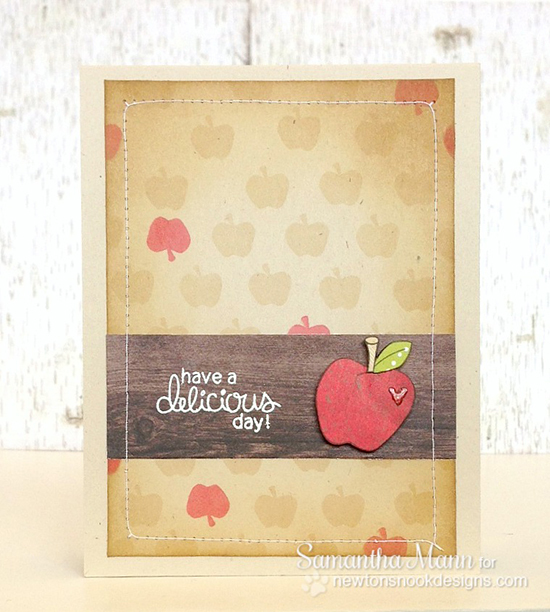 Samantha created this fun adorable apple card - wouldn't this be great for a teacher? 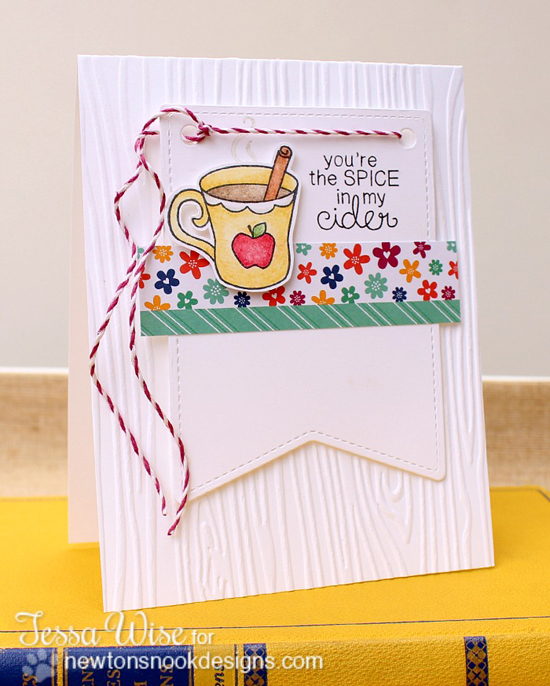 Shellye created this fun cider card - love that stitching and fun sweater background paper. 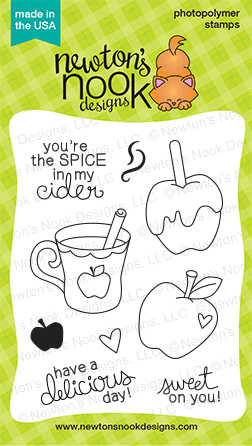 Taheerah created this sweet card with Newton hugging the giant caramel apple - what a fun idea! 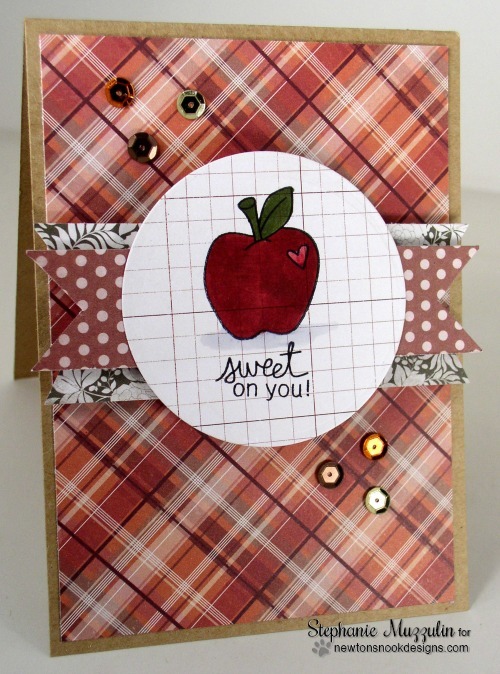 Stephanie created this fun apple card - love the plaid and checked backgrounds!! Lydia created this adorable apple card - she even created a background with the tiny apple image! Such a pretty white card with fun pops of color by Tessa. 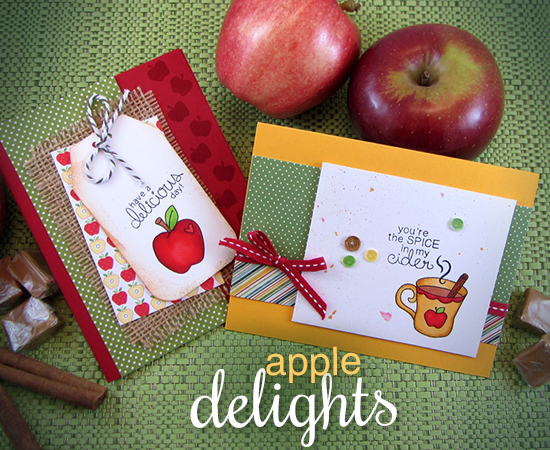 Would you like to win “Apple Delights”?This set will be given away to TWO lucky winners! Comment on the NND blog and Design Team and Guest blogs (see list below)! Two winners will be chosen at random from the collective blogs release posts. Make sure to check out each of their blogs and comment for your chance to win. You will not know which blog has been chosen so the more you comment on the better your chances are of winning! You have until Thursday, Sept 18 at 9pm CDT to comment -- winners will be announced on the blog post on Friday, September 19th. Adorable set today! I love the mix of fonts in the sentiments. They would work for a lot of different cards! Great projects everyone! I see a lot of us couldn't wait to gloss up the caramel on the apples, LOL! Jen I am really loving that burlap ribbon you have been using lately, and I really like that patterned paper on your pretty apple card too! I just love this fall-themed set! The caramel apples are adorable! Love a fun stamp set with clever sentiments. I've gotta have'em. this is a great stamp set. Thanks for having the hop. It's been fun. Love it! Super fun cards! Such a wonderfully sweet set (really, no pun intended!)! I LOVE these things most about Fall, and it just makes Fall the greatest time of year for me. You and your DT have done it again: dazzled, delighted and WOWed with another gallery of superbly crafted cards showcasing a set that is way, way, way tooooo fun! Apple awesome!! Oh yes, apples and fall and caramel...nice set. This set is adorable! Love it! Super cute! Love the sentiments...haha spice in my cider! Yummy! I love apples - this is such an adorable set and your DT did a fabulous job again today! I will try to remember to pop back to Larissa's blog later as I'd love to see the details of how she made the bag. Thank you for another inspirational day! This set is so cute and sweet! Love it! Such a fun set!!! I was just trying to figure out what to make my boys' teachers for little gifts - this set would be perfect! Congrats on another fabulous release. I love how Newton's Nook sets can be combined in so many ways. Great designers too! Wow!! These cards...and this team...I tell you!! Just wow!! Hooray! Love that caramel apple... what a fun set! all are wonderful to look at. It's beginning to feel like fall with this set. So many uses. Oh so yummy! Love all the projects! Are these not the most scrumptious cards or what!! The designers did a fantastic job!! Off to hop! I had such fun with this set!! Everyone had awesome projects with this one!! Happy Everything with Stephanie Muzzulin! Inky Paws Challenge #13 Winners!! Halloween Kitty Luminary by Crafty Math-Chick! Anniversary Possums by Chitra Nair!